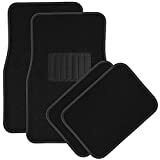 OxGord Carpet Floor Mats will protect your vehicle’s interior as you drive in comfort and style. The floor mats are designed to give your feet ease while on the road. Choose from one of several different colors and designs to match your vehicle’s interior and style. The floor mats defend your vehicle’s floor from dirt, mud, liquid, hair, leaves, and normal wear & tear. These non-skid floor mats are stain resistant, heat resistant, durable and easy to clean. Plus, they help prevent the elements from wreaking havoc on your interior, deterring damage and deterioration. DIMENSIONS: Front 17.5″ W x 26.5″ L – Rear 17.25″ W x 13″ L.
PROTECTION: Your vehicle’s interior is constantly under siege from the elements. These carpet floor mats will protect the front and rear floor from mud, snow, water, ice and more. BUILT TO LAST: OxGord’s Floor Mats are made with the highest quality carpet, built to last season after season. The weather and stain-resistant quality of our mats ensure that they will look new for years to come. EASY TO CLEAN: Use water to wash away the dirt, mud, hair, grit, grim and more. Decorate your vehicle with premium-grade floor mats at a pauper’s price with OxGord® Luxury Floor Mat Sets. Tailored from plush polypropylene carpet for maximum comfort and added noise dampening. Available in a large variety of color options. Trimmed with accent-hued binding and a heat-sealed heel pad on the driver’s side front mat. Backed with carpet-safe rubber nibs to hold your OxGord® Luxury Floor Mats in place. These official licensed OxGord® Floor Mats will include a 4pc Complete set of front and rear mats. The driver’s side front mat measures 18″ wide by 23″ long with notches for the gas pedal and footrest. The passenger’s side front mat measures 18″ wide by 27″ long. The rear mats both measure 18″ wide by 13″ long. OxGord® backs your Heavy Duty Luxury Carpet Floor Mats with a 30-day warranty.